Ellen Page is giving the country the message it desperately needs to hear. We’re at a crossroads in our American history, and we’re faced with a simple question, not dressed up in the sexiness of any 1960’s style movement: do we want to be better? There are clear political forces in the likes of the MAGA supporters who beat Jussie Smollett for being black and gay, or the boys who harassed a Native American man that say, no, being bad as a culture, where the bully can get more sympathy than their victim if he has the right PR firm, benefits them personally, and they would like to continue down on this direction. However, we have to get better, for the sake of our marginalized communities, and the sake of the world at large, we have to get better, and it is armed with that powerful message that Ellen Page comes to The Late Show with Stephen Colbert to discuss, at time getting emotional, and at all times on message, informed, and discussing the world. 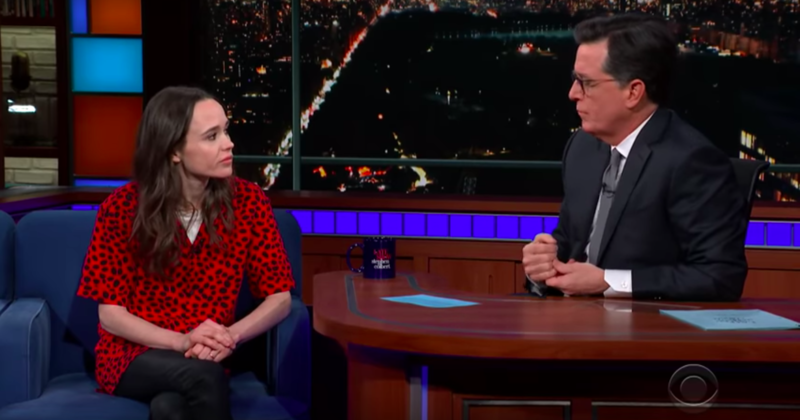 It’s a conversation that begins with a conversation about Ellen Page’s marriage, and then pivots to a discussion of climate change, when Ellen Page brings up the obvious: this isn’t a debate! Climate change is happening, and we’re still arguing in the media on wether or not people who run oil companies, and the politicians who profit from them know as much as pretty much as every terrified scientist. What’s worse, as Page discusses, the impacts of climate change hurt racially marginalized communities worse than others, as Nova Scotia’s black community, for example, lives next to a sink hole that would make living there next to impossible, and moving even harder. 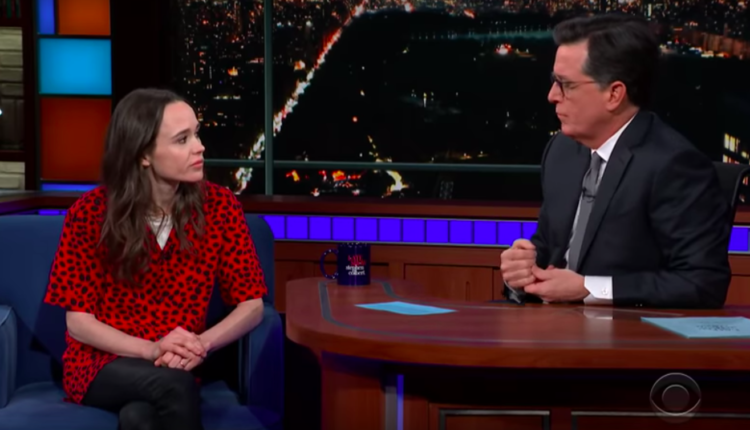 Ellen Page grows more impassioned when discussing the leadership of hate currently in our country, and talks about how Mike Pence’s homophobia, his belief in conversion therapy, his wife’s work at a school which excludes gay kids, and more which created the atmosphere for Jussie Smollett’s attack. Children are committing suicide, Ellen page says, with her incredible emotion and pain over the issue not hidden, and we must do better and demand better for our leaders. The audience bursts into applause as Ellen Page hangs her head, emotionally overcome by the power of the words she said and Colbert then plugs The Umbrella Academy, coming to Netflix and starring Page, as he must, and shakes Page’s hand. It’s rare you see celebrities use their platform as calls for empathy — and Page’s speech reminds me of Charlie Chaplin’s powerful speech from the end of The Great Dictator as he speaks out against Hitler. The hate in this country is palpable, and Page speaks out against it beautifully. Let us know what you thought of Page’s speech on Twitter at @WhatsTrending and watch our video below about the victim of a gay conversion camp.